June 26, 2017 – This week, our time machine visits New York City’s oldest bar, McSorley’s Old Ale House. Our theme song, “New York Ain’t New York Anymore,” laments the loss of places where “the sawdust is gone from the floor.” Well in this East Village landmark, where the clock has literally stopped, and that means still spreading the sawdust every morning — and that they refused to admit women until a federal court forced them to in 1970 (or build them their own bathroom until 1986). 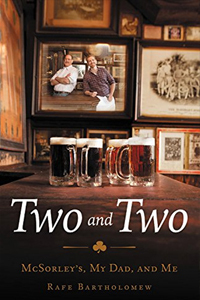 Rafe’s book is titled: Two and Two: McSorley’s, My Dad, and Me , and it’s as an heir to Joseph Mitchell’s famous 1940 piece in the New Yorker: “The Old House at Home.” Rafe is also the author of Pacific Rims: Beermen Ballin’ in Flip-Flops and the Philippines’ Unlikely Love Affair with Basketball , and was one of the original editors of Grantland. Find Rafe at Rafeboogs on Twitter or RafeBartholomew.com, and check out Bart’s works of saloon-inspired verse in The McSorley Poems: Voices from New York City’s Oldest Pub, as well as Volume 2: Light or Dark, at TheMcSorleyPoems.net.